You’re all comfortable in your favorite lounge chair, reading your latest novel with a cool beverage nearby…the aroma of your favorite BBQ drifting from the grill teases everyone…catching a few rays of sunshine never felt better. Warm weather calls us outdoors, and what better place to enjoy life than your deck! As an extension of your home, a deck can provide an attractive outdoor area that you can enjoy every time the weather allows. Whether just hanging out and lounging, entertaining or playing with your kids or pet, a well-designed deck can be a favorite part of your home. Understanding important deck design and planning considerations will help your deck become a successful project. 1. Where should your deck be placed? A characteristic of good deck design is when the deck can merge into the environment of your backyard without being obtrusive and highly visible. If you’re fortunate and have a great view, take advantage of the view and locate the deck to enjoy it. If you don’t have a spectacular view, perhaps your deck could be located near a beautiful garden tree. Maybe you want your deck in a shady area or with a sunny southern exposure. Is privacy from neighbors an issue? Are you near a busy street and is noise a problem? If so and if your space is limited, consider the use of shrubbery, walls or fences to resolve the problem. 2. Will the deck be connected to your home? If you are considering placing your deck near the living room, doing so could be a problem if foot traffic will soil your carpets and disrupt anyone that is watching TV or talking. Placing the deck next to the kitchen will make it easier to move food and dishes back and forth when eating outside on the deck. Use sliding glass doors to make the outdoors look even more inviting from the kitchen. Would having two doors connecting different rooms to the deck be a possibility? Having two doors accessing the deck will be the most efficient and best solution for easy foot traffic flow. 3. Do you want a destination deck? The deck doesn’t have to be built connected to your house; it can be a place to go all by itself. If your backyard extends to woods, maybe locating the deck near some beautiful trees makes sense. If your property fronts a pond or lake, what about locating your deck so that it reaches out into the water? If you have a flat roof, say, over a garage — what about a roof deck? The possibilities are endless! 4. How will your deck be used? If your property is small and you’re not expecting to entertain large groups, you likely don’t need a huge deck. Your deck should maintain a reasonable scale between your home and property size, size of your family and the deck size. You should not have a small house, small property and a very large deck. The elements should be proportional. You should not build a small deck if you have a large house on large property. 5. 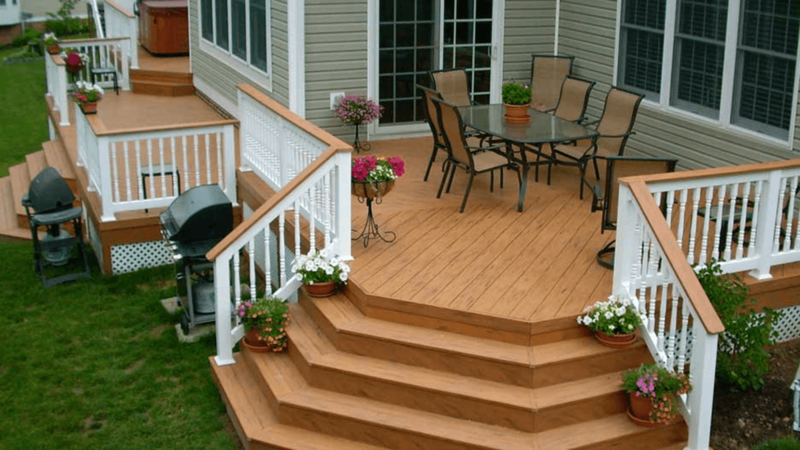 Are you considering dividing your deck into different areas? For example, you could have an area for lounging, sunning or reading and another area for dining, entertaining and cooking. Involve your family and make a list of the activities you would like to have. You may want to include a section for children’s games and playtime. Have a good idea of how traffic will flow on the deck and in your backyard. Understand how family, friends and pets will be walking from the front of the house to the backyard, from the garage to the kitchen, from the greenhouse or tool shed to the garden and so on. If you are going to have a deck area for relaxation, you don’t want all the traffic coming out of the house to merge into this area. 6. What shape deck is best for your home? When designing your deck, consider using a variety of shapes. Keep it simple, but don’t be afraid to add an angle or two to the deck design. For example, add curves or diagonal lines to connect two rectangular or square spaces for the deck plan. Connect the different sections with paths, paving surfaces, stairways, arbors, gazebos or perhaps a water pond. Consider using planters or flower pots with attractive plants, overhead structures or trellises, benches and steps to create a transition between areas in the backyard. If you’re not a good gardener, you can still create a low maintenance landscape by using shrubs and other easy-to-care-for plants. Formal landscapes are more symmetrical and use geometric patterns and straight lines. Informal styles use more asymmetry and more curves — wooden decks are often associated with an informal setting. 7. Do you hire a deck designer, do you use deck plans or do you design the deck yourself? Consider using deck plans if you can find plans that you like. One of the best ways to simplify deck building is to use deck plans that have been successfully built before. If you need to make some modifications to suit your needs and home, doing so will likely be cheaper than creating deck plans from the beginning. Unless you live in a very rural area, you will need to check with your local building department to find out what requirements and restrictions exist in your area, especially if you are designing and building the deck yourself. If you’re not comfortable with the process, consider hiring a professional deck designer and a deck contractor. Done correctly, building a deck will provide countless hours of enjoyment for you, your family and friends as well as increase the value of your home. After all, isn’t enjoying our time off why we work so hard? Visit Building Wooden Decks and learn more about creating the perfect deck for you and your home.